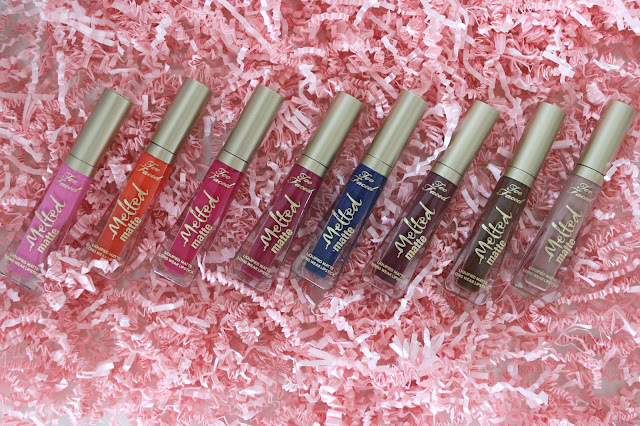 I'm going to start off by saying I'm not a huge liquid lipstick lover. I know some people really only wear them, but I'm generally a fan of a sheerer lipstick, or even a stain. 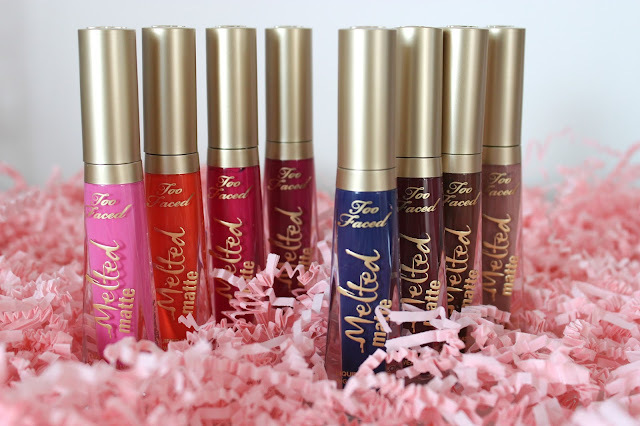 That being said, I know people absolutely love the original Too Faced melted lipsticks, so I was really interested in trying out the new range. 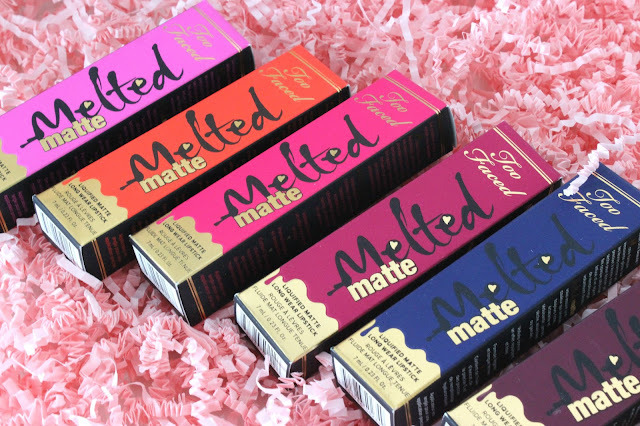 While I was sent the lipsticks, all opinions are 100% my own, as always. Keep reading to find out what I think about the Too Faced Melted Matte lipsticks! - they are really long wearing. I had a 9 hour shift at work, and while I did touch up (more out of habit than anything), I really didn't need to. It stayed put the entire time. - they are thin enough you can layer them. 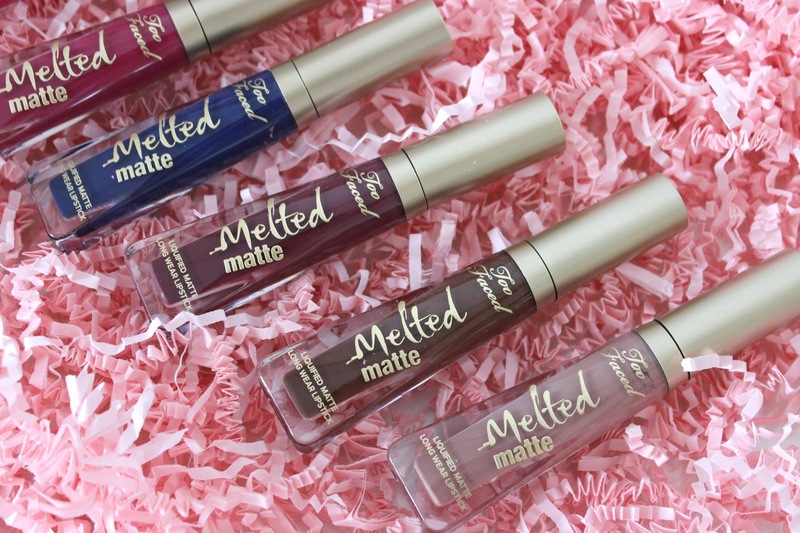 I know a lot of people say that other liquid lipsticks go crumbly when you try and layer throughout the day, but I haven't had a problem with any of these. -The colours are a bit . . out there. There wasn't really one colour of the bunch that I loved. 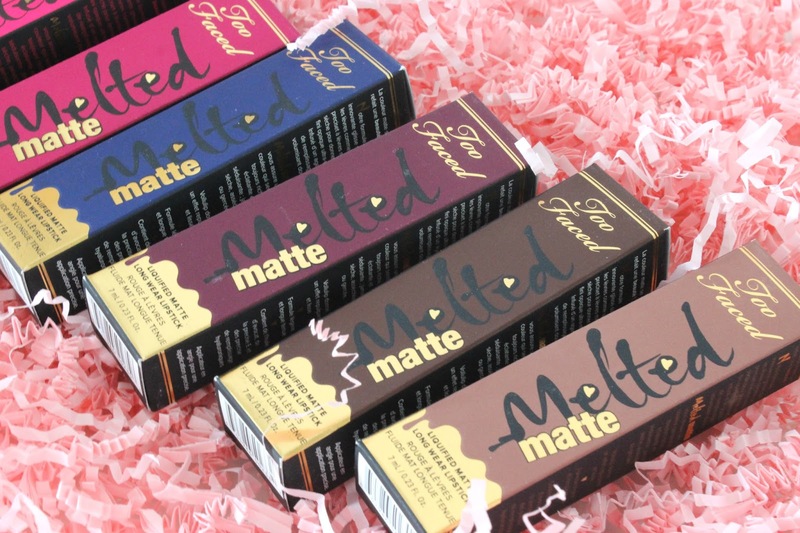 My ideal lipstick colour is like a rosey-pink, and there were a lot more brown-y hues in this collection. -It's a bit tricky getting a crisp line around the edge of the lips. A lip pencil or lip brush would be ideal with these, but that's common among all liquid lipsticks. It does have a doe-foot applicator, which is really nice, and once you have a liner on, it makes application a breeze. -They are a bit drying, and I found they did emphasize lines on my lips. 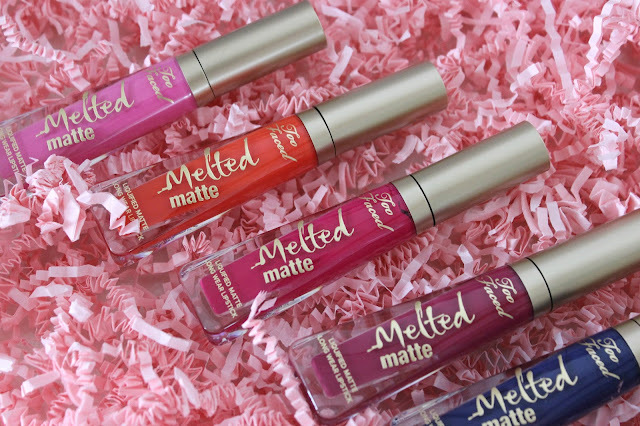 Again, I don't often wear really mattifying lipsticks, so it was unusual for me to see my lips looking so parched. They didn't feel uncomfortable at all, but they definitely looked it. I think I will get a lot more wear out of these colours in the fall. They apply beautifully, feel very comfortable, and are incredibly long lasting on the lips. They also came off very easily at the end of the day, which was surprising. My normal Bioderma micellar water removed it with minimal effort. So huge bonus there! That being said, they are definitely in-your-face attention grabbing lipsticks. Whether it's a barbie pink, neon orange, or navy blue, it will be something you'll have to coordinate the rest of your look around. I think if you want something that you can apply in the morning, that will be hassle free and last all day, then these are a perfect option. If you prefer something really wearable, and that is comfortable and hydrating, then I'd steer clear of these, and try the Too Faced La Creme or La Matte lipsticks instead (which I reviewed here).